Installing a new pool in your home is a big deal, and you will probably have a bunch of ideas and questions about what is the best pool for you. At NQ Pool Warehouse we can help to make things a lot clearer for you and get you moving in the right direction. We understand that you will have a vision for what you would like your pool area to look like, so we want to make the decision making process easier for you, by providing you with some frequently asked questions, to get you started. What size pool will best suit my needs? At NQ Pool Warehouse we have a large variety of different pools of varying shapes and sizes, so the size of the pool that will suit you perfectly will depend on how much space you have and what you intend to use it for. 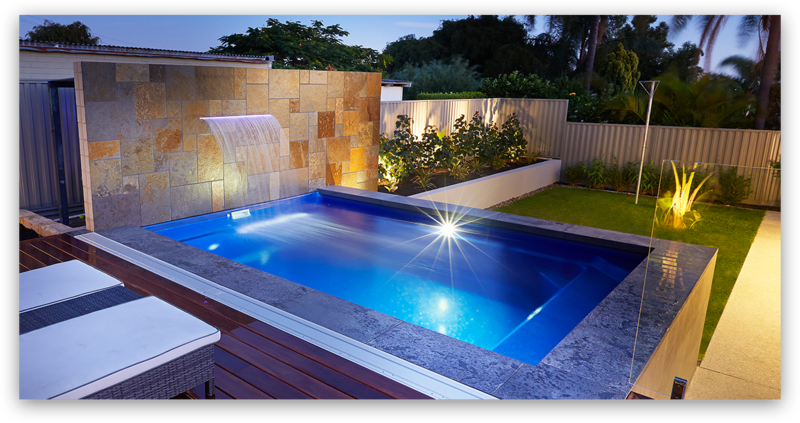 You can also choose from a range of optional extra such as pool lights, if you intend to use your pool at night, or want it to be a feature of your garden while entertaining. How much room do I need and will I have enough access for excavation and installation? Usually double gate access (3 metres) to the yard will provide sufficient space for the installation of your pool, but access can also be gained through a neighbouring yard, or by using a crane. Will the existing underground pipes or wires hinder the process? Your sewerage and service plans from the Council will show us everything we need to know about the pipes and wires that are already laid in your garden. Relocation of these can be done should they be in the way of the pool work. Talk to us about any additional costs that may be involved. What filtration system best suits my needs? The two different types of filtration systems available are the sand filter and cartridge filter which are both suited to different areas, depending on the water conditions at the property. We are happy to advise you when we provide our quote about which would be best suited to your needs, based on the type of water you use in your home, and how you intend to use your pool. What size pump will best suit my needs? The size of pump that is needed is dependent on the size of the pool and how far away the pump is located from the skimmer box. Energy efficient 3 speed variable pumps are extremely cost effective and will save you money on running costs of the pool. What is the difference between salt water chlorinators and traditional chlorine pools? Salt water chlorinators are like having a beach in your backyard, but as with the traditional chlorinators rain water will alter the chemical balance so adjustments will need to be made accordingly. How much area do I need fenced for the pool area? All pools need to be completely fenced with a 1.2 metre high fence, and ensure that they adhere to local council regulations. We can advise you on the other details to ensure that your pool is compliant with current legislation. The size of your pool area is totally up to your own discretion, and will depend on what else you want to do in the area. If you want to install a barbecue area, spa or have an area for lounging by the pool, this will need to be considered before fencing the area. Will I need extra concrete pathways? When planning your pool area you will need to consider where you want pathway access and other concrete areas to be installed so that everything is to scale. Is there a backup service available for my pool and filtration system? Your pool comes with a 25 year structural warranty and an 8 year internal warranty from the manufacturer. Installation of the pool is covered by the QBCC for 6 years and 3 months, and filtration and other equipment comes with their own warranties ranging from 12 months to 10 years. We are happy for you to give us a call if you have any problems and we will help you solve any problems you encounter. Is there any benefit in choosing a fibreglass pool over a concrete one? Both concrete and fibreglass pools have their own benefits, and our unique backfill system is designed specifically for the Townsville soil and conditions. How long will it take for installation? Under normal circumstances a pool can be installed in as little as 2 days, but the entire process usually takes around 2 weeks, so talk to us today about how we can get you in your pool for Summer.